I had originally planned to write a little mini-feature on this little iOS App Store tapping game, but here’s the thing: I never got to a point where I wanted to retire from playing with it and put together a little review. It’s odd that something like Magikarp Jump would appeal to me, but Nintendo seems to have built a game that scratches an itch I didn’t know I had. Magikarp Jump takes a leap towards building a character out of the mysterious little water Pokemon known as Magikarp, giving it a purpose, aside from being the predecessor to Gyrados in the main series of games and mere fuel for a Gyrados in Pokemon Go. We’ve all caught enough Magikarp to feed a metaphorical family of five for a fortnight, but there was always that twinge of irritation every time we’d get into a random encounter in the water, or cast out a fishing line hoping to snag a rare ‘mon, only to be greeted with this big stupid fish flopping around on-screen. One of my earlier scores! Magikarp doing what it does best – nothing at all. Well, thanks the Magikarp Jump, this is no longer the case! Focused on this pointless little fish and riffing on the concept that it is, indeed, a completely useless Pokemon is the whole point to this freemium little tapper. Now I’ve mentioned “tappers” and “tapping,” and if you’ve played a game that falls under the category of a “clicker,” this is merely the “new-age” equivalent of that. Clicking is for the birds, and Magikarp Jump focuses on fish. Get with the program! Essentially within these “clickers” and “tappers,” there is a light element of gameplay, wherein the player essentially makes things happen by tapping on things. There is no skill involved, whatsoever. I’m sure you’ve read about this game since it released a few months ago, and perhaps played it yourself, so I’ll spare the full explanation of the features. Heck, calling them “features” is even a bit of a stretch, as it’s more in line with the feature set of a Tamagotchi than an actual game. You can feed and train your Magikarp, leveling it up, and battling it in a jumping contest of epic proportions. Eventually you cannot level up any more, and your Magikarp retires after facing repeated battles until it loses. Then you fish up a new one and start the whole process over again. And then again, and again, and again. Each new Magikarp you catch belongs to a new “Generation,” and you are free to name it whatever you want, perhaps to match its gender or body type and pattern. Sound fun? Perhaps not really, but keep in mind that this is one of those “time waster” games that’s meant to be played for roughly three minutes at a time. You run out of Training Points and food, and eventually you need to spend money or simply wait until it’s all regenerated, which typically takes between a half an hour and an hour and a half. Makes sense, right? Magikarps don’t just have infinite energy, you know! They need rest, like you and me. Right before I quit for good! The longer you play, the more levels your Magikarps can attain, the more you can upgrade your food and training XP rewards, etc. You can spend Diamonds, the in-game currency of the game that can be bought with hard cash, to enlist the help of more Pokemon characters to help your Magikarp train most efficiently, jump higher in battle, and have better odds in the plethora of random situations that occur. Of course, the odds of saving up enough Diamonds without spending actual cash are pretty low, since you generally find very little of them. I consider Magikarp Jump to be in several classes of games, mainly “toilet gaming,” and “elevator gaming.” I don’t think I need to explain what each of those are. But those of you who find yourself on an elevator, waiting outside a changing room while your wife tries on 30 pairs of jeans, or, yes, going to the bathroom, this game is a pretty solid option. Let’s talk longevity, though. How long does the fun last for? Better yet, let’s jump right into the talking point here. It may have turned into a cliché, but regardless, the definition of insanity it’s is doing the same thing over and over and expecting a different result. Magikarp Jump is exactly this definition, turned into a video game. After you “retire” each Magikarp and get a new one, your “Learning Bonus” goes up by 10%, and your next Magikarp gets +1 added to its Max Level. However, you now need more XP to max out the next Magikarp. Both of these “upgrades” negate each other. Each League is exactly the same, where each trainer’s Magikarp scales upwards, just like yours. Training is completely random in every aspect. This is from playing 27 levels, and I’m convinced there is nothing that the player can do to change the odds of getting a Good, Great, or Amazing rating. There’s not actually a purpose or an end-game here, because you just keep scaling the numbers. Jumping 10 meters high is no different than jumping 100 meters high when the League trainers’ Magikarp scale exactly like yours do. Each Magikarp you raise essentially gets you through one more trainer in the current League. For example, if a League has 8 trainers to get through to become the champion, it will take roughly 8 generations of Magikarp to get through. Even with the random nature of Magikarp stats, I’ve never had it happen where I was able to beat more than one additional trainer in a generation. Let’s take a look back at these for a minute, because two of these points stand out amongst the others: the first and the last. It’s also worth noting that things get weird. Charming, and weird! In regards to the first, think of it this way: if you got 10XP for each food, and you needed 100XP to level up, that would take 10 food pieces to level up. Now, your next level needs 120XP to level up, but the food now gives you 12XP each. However, it still will take 10 food pieces to level up. Time is never actually saved. some action takes a long time to do, and wastes your time. after you do this action a certain number of times, you can upgrade it so you don’t have to do it as often. now you need to do some other action. 27 levels later, and I’ve come to realize that nothing is correctly scaled in this game. Each generation of Magikarp actually takes longer to raise to maturity, despite getting new food, new training regiments, and XP bonuses. 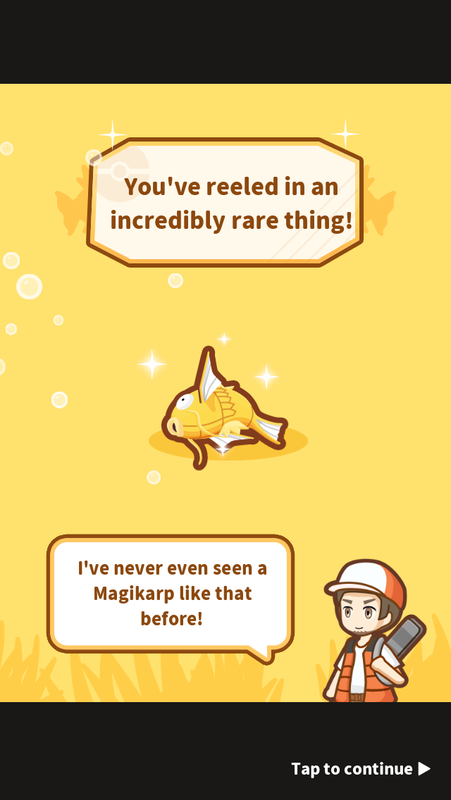 The closest you can get to raising a Magikarp faster is if they are of a Rare type, and they happen to come with absurd training bonuses, which did happen to me for two or three generations. As for the last point in regards to the trainers, from what I have experienced, each generation of Magikarp you raise only gives you enough of an XP ceiling raise to allow you to beat one additional trainer. However – each time you raise a new Magikarp, you have to restart the whole league, which means going back through all of the previous trainers and beating them, each time. You are allowed to skip the whole animation for the jump battle, but it still is time consuming and very pointless. An example of the League layout. Each step represents a trainer battle. Let’s do some quick math! If each Magikarp can get you one trainer closer to the League Champion, to figure out how many battles we will need to beat to get through a single League, we need to add each number between 1 and the number of trainers in the League. With me so far? The Fast League is the one I am stopping on, which has 15 total trainers. That means that the first time I take a shot at the League, I will win only 1 battle. The next generation, I will only win 2 battles. The next generation, 3 battles, and so on and so fourth. So how do we figure out how many battles it will take to beat a League? 120 total trainer battles! To finish a single 15 trainer league! 1,390 total trainer battles to beat the game. If I wasn’t planning on completely Magikarp Jump, it’s the math above that would have solidified it for me. Look, I know it’s a clicker and it’s not quite intended for mental stimulation, but I really feel like I’ve lost my mind from playing it. I’ve been driven to insanity. I will say that one of the most satisfying things to me was the very beginning of training a new Magikarp, and having them level up fifteen levels instantly as I fed them a piece of super upgraded Magikarp snacks. But as soon as you get within 5 levels of your max level, it goes right back to taking forever. I don’t know how much time I’ve spent in Magikarp Jump, but after beating four or five Leagues, I am ready to throw in the towel! Of course, this is a goofy game that breathed actual life into the most useless Pokemon to date, so I can’t say it isn’t appreciated, in fact, quite the contrary. 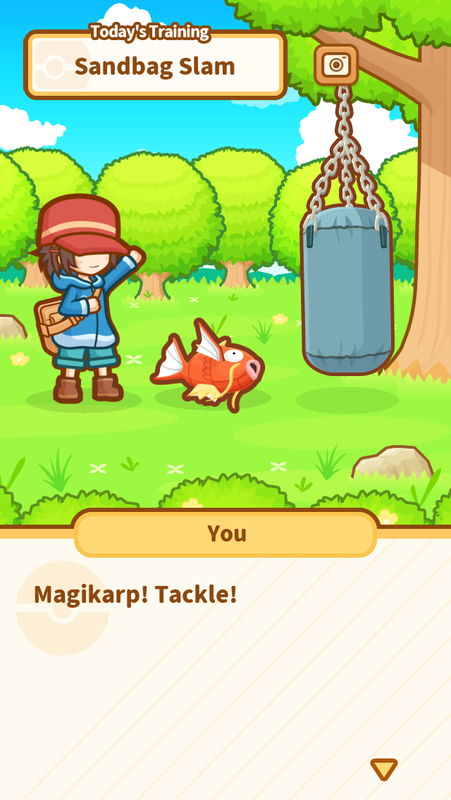 All things considered, is it possible that the totally pointless nature of this game is an analogy to Magikarp itself? Or is it just a major exercise in futility that can only lead to insanity? Before I dig myself into having an existential crisis over an imaginary fish, I’ll let you decide for yourself. Thanks for reading! Let me know what you thought about Magikarp Jump in the comments below! Next Post Question of the Month: September 2017! It’s a shame about the levelling issues and everything but whenever I saw a picture of the game on your post I couldn’t help thinking how cute the game art looks! I always feel sorry for Magikarp as well so I’m glad it has its’ own game now. It’s actually really well done and they did a perfect job pandering to the younger crowds who love the free mobile games. Would love a (paid) game like this where you get to raise one to adulthood, with the eventual goal of releasing a Gyrados in the wild, to wreak havoc wherever it goes!